It's that time again, time to copy those funny/weird/strange FB (or twitter) status updates for an easy and fun post. Then grab the button, publish your post and link back up with CA Girl or I. My commentary is in blue. Sometimes on facebook we take the time to ask the world why certain things happen. "Why am I always the one making the stupidest face??? :)"
"Why do I always pick the wrong line at Wal*Mart?" "Having a blood pressure machine in a Walmart seems a little ironic. "-Actually that is incredibly smart as they know being in their will raise your blood pressure making your more likely to stop at the pharmacy and ask what you can buy to lower your blood pressure. "I think that limiting the nuggeting of animals to only chicken was a mistake." "Fact: Married people cut their toenails less frequently than their single counterparts as to have weapons during blanket-stealing warfare." So see fun and easy! Grab the button, write your list and link up. It makes CA Girl and I so happy when you do! I had a status about cleaning the other day! Thanks for the giggles! The total number is 5. At least that I can remember. The toe nail one was the best. Great stuff. I like the way you set it up this time. Very clever. And we do seem to post that way. The toenail one is cracking me up! I saw Laurie's about the wrong line at Walmart!!! LOL So true! Hmm ... I linked up - for the first time! Woo!! 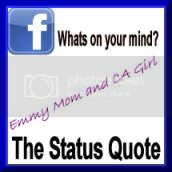 There are a ton of fantastic status' lately! Hahahaha! Waking up from a nap by a book to the head does not sound fun! Which of your darlings was responsible? too funny. And I think I've had a book dropped on my head too . . . I love Ross's last comment. I totally giggled out loud because I swear music artist's are wrong all the time! You make a good point about the BP machine in Walmart! It's a total conspiracy! very funny quotes...my friends on FB are always cracking me up!! FUNNY! My favorite one is the one about the nuggets. I just can't even imagine saying that. Ever! Cute idea for a post, Emmy. You are so dang clever! The nuggeting one makes me crack up! I cant even get the words to twinkle twinkle little star right. I laughed so hard about falling over while putting pants on...And I thought I was the only one that happened to.